Do you really need a magnum cartridge when the good old standards still serve us so well? During the first magnum craze, late 1950s to early 1960s, I was just an impressionable kid. I survived, but it was some years before I could take an unbelted cartridge seriously. Most of us have survived the second, turn-of-the millennium, magnum craze. Over just five years we were asked to accept more than a dozen new unbelted magnums, all with fat cases of varying lengths. Just a few of these have gained significant followings, and some are already gone. Right now, it seems to me there’s a reactionary trend in the air, back to standard, non-magnum cartridges. 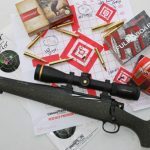 Although it’s been around for nearly a decade, Hornady’s mild little 6.5mm Creedmoor has recently skyrocketed and become the shooting world’s poster child. Everybody is making them…and it seems that everybody wants one. Guilty as charged. I don’t have a Creedmoor, but I’ll probably get one this year. I’m waiting for better left-handed availability. I have used several Creedmoor rifles for various articles, right-handed rifles that I returned. 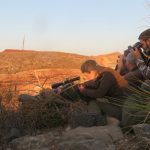 Designed for long-range competition, the Creedmoor is a great little cartridge that, in my experience, has consistently delivered fine accuracy. However, because of all the buzz I think it’s misunderstood. 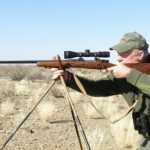 Taking advantage of 6.5mm bullet aerodynamics, it remains supersonic well past 1,000 yards, yet has minimal recoil and blast, great advantages in long-range competition. 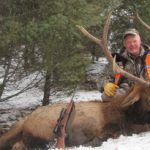 It is also a fine cartridge for deer-sized game and, with the right bullets, could be used for elk. Except: While it’s a fine long-range target round and a useful hunting round, it is not a long-range hunting cartridge. 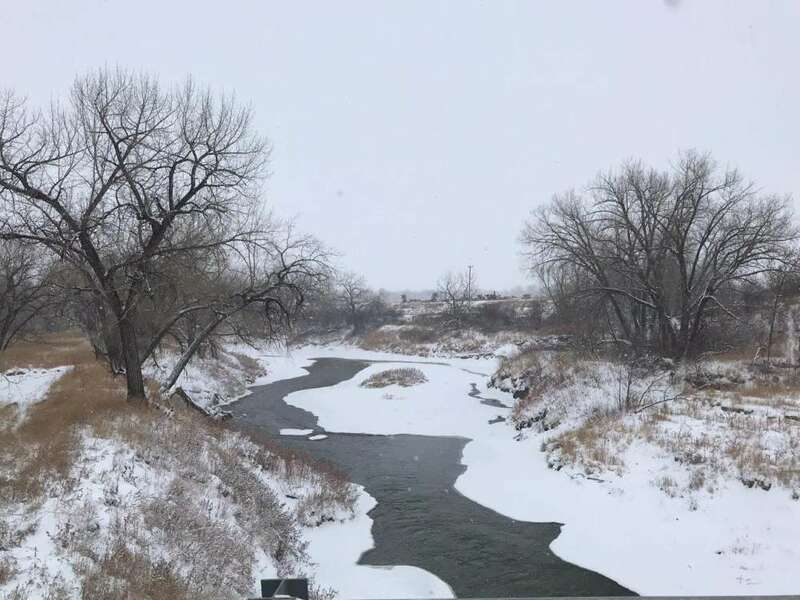 Designed for mild-mannered efficiency, it just doesn’t have the retained energy or bullet weight for big-game beyond medium range. 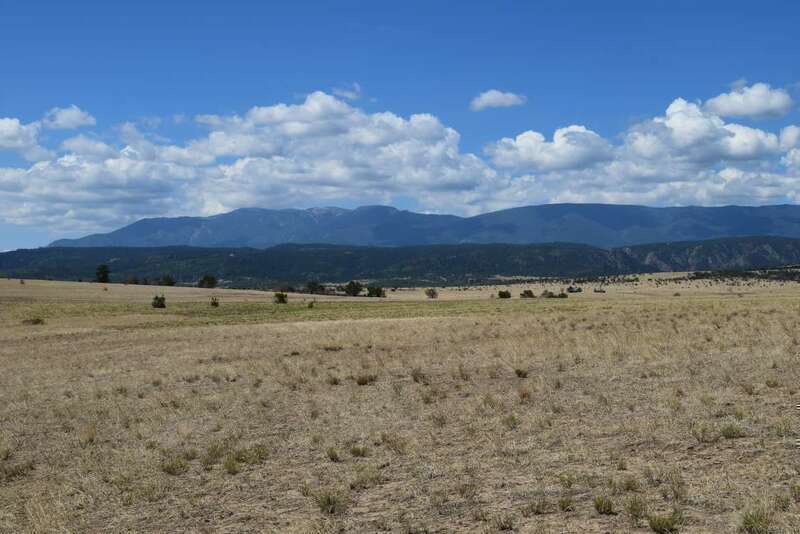 Exactly why the Creedmoor has suddenly “caught on” is a mystery. Both the .260 Remington and 6.5-.284 Norma pre-date it and are slightly faster. I don’t have much experience with the 6.5-.284, but among the rifles I’ve used I have found the Creedmoor more “on-average accurate” than the .260. However, that may be more about platforms and ammo than cartridge design. All three of these modern mild 6.5mms have won long-range titles. All are great hunting cartridges. None, because of frontal area, bullet weight, and velocity and retained energy, are truly versatile hunting cartridges. At least in my opinion. 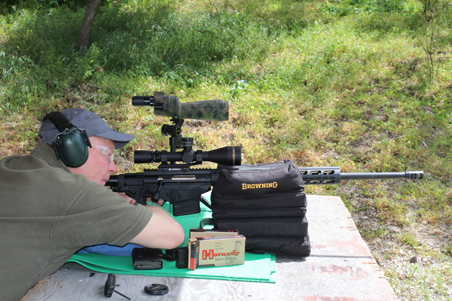 On the bench with a Ruger Precision Rifle in 6.5 Creedmoor. Like all the 6.5mm Creedmoor rifles I’ve used, this one was spectacularly accurate, but while it’s a great long-range target cartridge, it is not a great long-range hunting cartridge. This is not exactly new. Exactly the same can be said about the great 6.5x55mm Swedish Mauser. Dating back to 1894, it remains popular in Europe and, although rarely chambered in new U.S. rifles, it retains a loyal American following. In the Nordic countries, with heavy bullets, it’s still a standby for moose; over here most of us think of it as a mild-mannered and effective deer cartridge. On average it probably isn’t as accurate as the three newer 6.5mms. As factory-loaded today, it also isn’t quite as fast. Neither matter because no one thinks of it as a long-range hunting cartridge, and few Americans use it for game larger than deer. 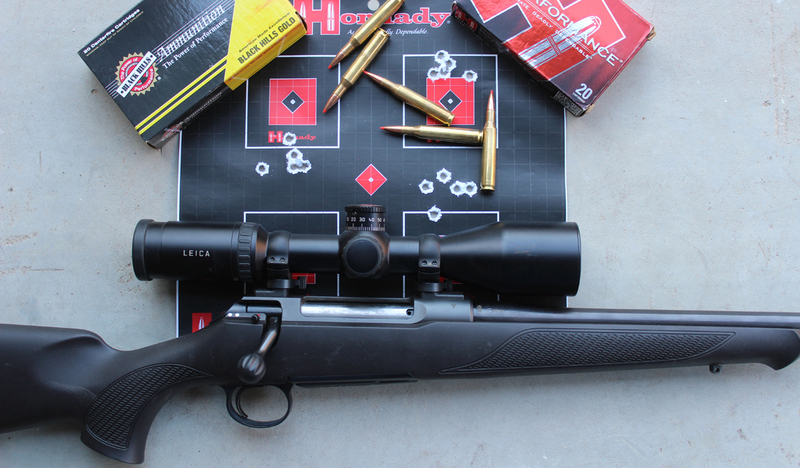 Thus, as a hunting cartridge, it fills the same niche as the 6.5mm Creedmoor and its peers. Although I’ve long admired the 6.5×55, I’ve never owned one. I’m sort of fixated on another standard solution that, for me, fills the same niche and does it better. That’s the 7×57 Mauser (aka .275 Rigby), developed in 1892. Yeah, I know, Walter Bell shot bunches of elephants with it, and O’Connor used it for most of his desert bighorns. I don’t see it in either role; for me it’s a fantastic medium-range cartridge for deer-sized game and wild hogs. 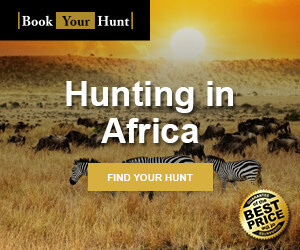 It’s also a fine cartridge for African plains game, in part because, in Africa, shooting much beyond 200 yards is unusual. You could switch out the 7×57 for another standard cartridge, the more recent (1978) 7mm-08 Remington. The relationship of the 7×57 to the 7mm-08 is much the same as the 6.5×55 to the 6.5mm Creedmoor. The only possible difference is that, because of both case capacity and action length, the 7×57 has the capability to use 175-grain bullets; the 7mm-08 really does not. 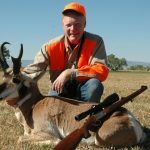 I prefer the 7×57 because of history and tradition, but both fill the same purpose: Mild-recoiling and effective medium-range cartridges, ideal for deer-sized game and adequate up to elk. There are, however, three non-magnum cartridges that I do see as general-purpose hunting cartridges. Perhaps not for this current specialized silliness of extreme-range shooting at game, but certainly for almost all of the hunting most of us actually do. Despite the magnum crazes and the current Creedmoor hysteria, standard solutions have long been in place: .270 Winchester, .280 Remington, and .30-06; all based on the .30-06 case. 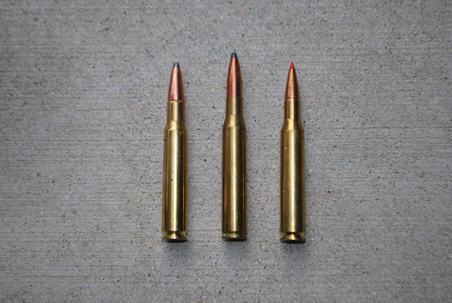 Left to right, .30-06, .280 Remington, .270 Winchester. These three non-magnum cartridges are among our most versatile options for the majority of big-game hunting in North America and the rest of the world. Jack O’Connor is best-known as the .270’s champion. From the 1940s he shot most of his sheep (and piles of other game) with the .270. But he owned 7×57 rifles for the rest of his life, so perhaps he came to see it the same way I do. He also owned .30-06 rifles for the rest of his life, and admitted privately that the .30-06 was more versatile than the .270. I like both cartridges. The .30-06 is probably over-powered for deer-sized game (which includes sheep), but with 180-grain bullets it’s a much better elk cartridge than the .270. That said, my personal longest shot on an elk was made with a .270 and a 150-grain Nosler Partition: Just over 400 yards, one shot and down. The .30-06 is also better for the full run of African plains game. 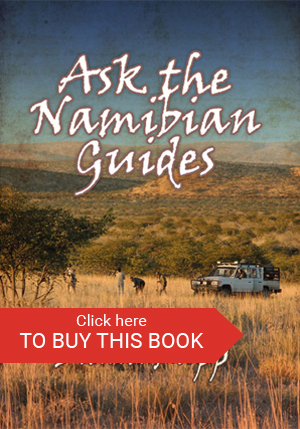 But, that said, Donna and I both have taken a lot of African game with .270s. Somehow, perhaps because of all the fast .30-caliber magnums, the .30-06 has a reputation as a slow old-timer. It is not. Standard velocity with a 180-grain bullet is 2700 feet per second (fps), adequate though not impressive. However, handload recipes can push a 180-grain bullet beyond 2800 fps, and extra-fast factory loads like Hornady’s Superformance do this right out of the box. 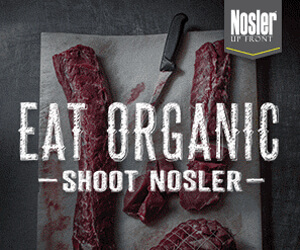 If you don’t need the heavier bullet, 150-grain loads at 3000 fps are available. These velocities are close to “magnum” performance—in lighter, more compact rifles, with lighter, more compact ammo. With 130- or 140-grain bullets the .270 is faster and shoots flatter. It is enough gun for any North American deer that walks, and effective at any sensible range. I think O’Connor was pretty much right: It’s an ideal sheep/goat cartridge…but the .30-06 is more versatile for larger game. 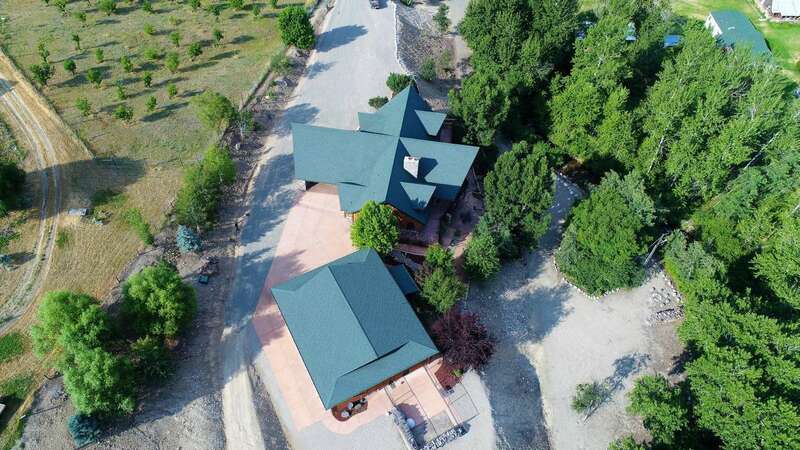 If you need to push the envelope, .30-caliber bullets in 200 and 220 grains are readily available and there isn’t much these heavyweights can’t handle. Now, if you’re looking for the ideal compromise, consider the .280 Remington. Introduced in 1957, it may be the best (or at least most versatile) cartridge based on the .30-06 case. It is faster and flatter-shooting than the .30-06…and slightly faster than the .270 with 140 and 150-grain bullets. It takes advantage of the 7mm’s superior bullet aerodynamics, and can push 175-grain heavyweights at meaningful velocities. Thus it’s just as good for mountain game as the .270, and with heavier bullets it’s almost as good as the .30-06 for elk and such. The only thing: You must be somewhat of a contrarian to choose the .280 over the .270 or .30-06. 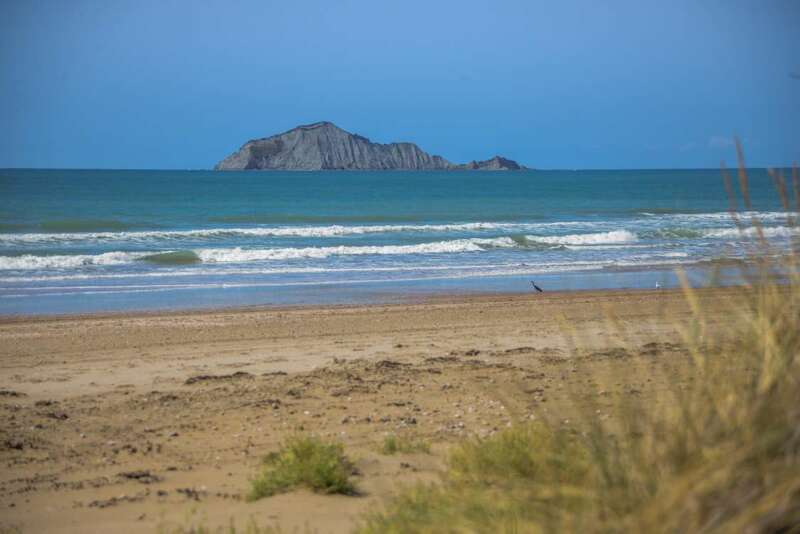 Despite its attributes it has never been as popular as its siblings. 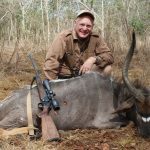 Selection and availability of factory loads is more limited, and in order to love the .280 you must be prepared to take a lot of guff from your hunting buddies. I don’t mind either limitation; I’ve had .280 rifles and they’ve performed well…but I don’t have one now. Whether I’ll someday have a .280 again or not I simply can’t say, but it’s been many, many years since I’ve been without at least one .270 and a couple of .30-06s. If you’re looking for a versatile hunting rifle that won’t kick you into next week all three are sound choices. 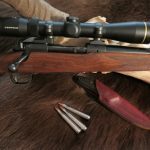 It’s pretty much as Jack O’Connor laid it out so many years ago: The .270 is ideal for mountain game (and, from me, for deer-sized game). The .30-06 is more versatile because it’s better for larger game. Or, split the difference and consider the .280 Remington, provided you don’t mind being a bit different. 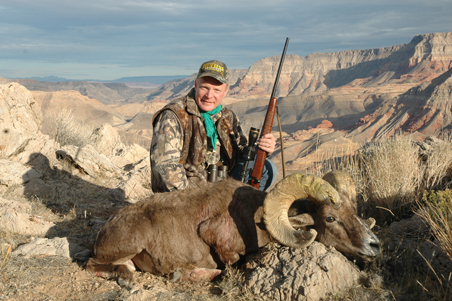 Below: A good Arizona desert sheep taken with a CZ in .270 Winchester at 250 yards. 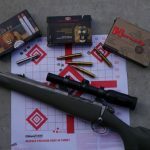 Jack O’Connor was right about the .270: It’s an ideal cartridge for mountain game, and it’s adequate for game up to elk, but the .30-06 is more versatile for larger game.